Available as low as $7.49 per oz over spot! Fans of the reality television series Meerkat Manor have something to celebrate if they also happen to be numismatists. The furry, troublesome little creatures have been chosen to represent the African continent on the latest coin in the Rwandan Wildlife Series from Germany’s BH Mayer Mint. Today, Silver.com has the 2016 1 oz Silver Rwandan Meerkat Coin on sale for investors and collectors. 9th release in the popular Rwandan Wildlife Series. Individual coins ship in a protective plastic seal, while multiples of 10 ship in plastic sheets. Issued a face value of 50 Francs by the Central Bank of Rwanda. Features the latest design of a Meerkat on the popular coin series. Meerkat Manor followed the exploits of a large family of meerkats on the African savannas and deserts. The creatures entered the hearts and minds of Americans at that point in time, and now numismatists can enjoy their image on the face of the increasingly popular Rwandan Wildlife Series coins. The Rwandan Wildlife Series is another of the rising bullion coin programs from the African continent. Although minted in Germany, it celebrates the diversity of wildlife on the continent, and is gaining the attention of investors and collectors just as the Somalian Elephant coin program. On the reverse face of all coins in the series you’ll find the Rwandan coat of arms. The official seal of the nation is featured in the center of the design, with inscriptions around the outside of the design all written in a local tribal tongue. Each coin bears a face value of 50 Francs, and is issued on behalf of the Central Bank of Rwanda. The obverse features an outline of the continent of Africa, which dominates the right face of the coin on this side. To the bottom left you’ll notice a family of meerkats playing in their desert home. 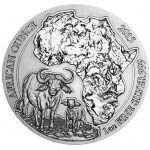 Engravings include “African Ounce,” and the coin’s weight, metal content, purity, and year of issue. Each coin in the Rwandan Wildlife Series is produced by BH Mayer Mint in Germany. The coins are struck at a Munich facility within the company. Silver.com encourages all customers to ask questions when they arise. Please direct your questions about the 2016 1 oz Silver Rwandan Meerkat Coin to an associate at 888-989-7223, connect with us online through our live chat, or submit an email with your question. If you are interested in similar products, be sure to check out our full selection of Silver Bullion.